Brooklyn Bridge stands as a spectacular land mark and an Inspirational True Life Story for people who is afraid of facing obstacles. Obstacles, ask any one whether he would love to face obstacles, 95% would say “No”, Why should i be the one to face obstacles? Some even feel that it is only they who face obstacles. But the reality is different. All of us face obstacles in our day to day life. It is only the magnitude of the obstacle that varies, depending on the activity. 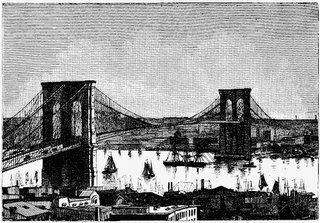 Brooklyn Bridge, The Inside story, showcases that obstacles can be overcome with determination and persistence. , it was in this year he came out with his idea to build a spectacular bridge to connect Long Island with New York. Since there was no other bridge of its magnitude at that point of time the experts rejected his idea saying that it was an impossible feat. The whole world was against his idea and told him to drop his plan. 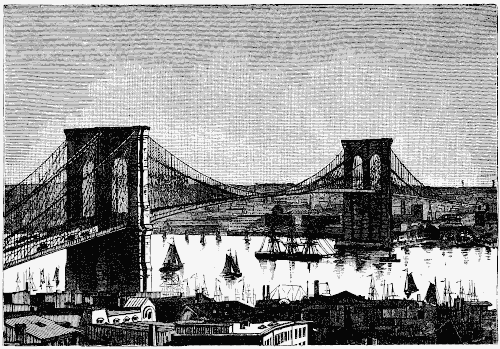 Roebling’s Intuition kept telling him that his vision was right about the bridge. The only support he had for his idea was his son Washington, who at that time was an upcoming engineer. They together prepared a detailed plan and recruited the necessary team. Though they were well prepared for bottle necks, a tragic accident occurred at the site killing Roebling. This incident happened few months after the bridge building work had started. Normally anyone would have given up. But Washington wanted his father’s vision come true. Fate was so cruel that washington suffered brain damage and was injured to an extent where he became immobile. He could neither walk nor talk or even move. As usual the experts who claimed the bridge cannot be built started raising their view points of how they had advised Roebling to not involve in this project. Both were termed Crazy and fools. There was an uproar about scrapping the construction project terming that Washington was not in a position to extend his services. But these did not deter Washington. He was clear about his objective. He depended entirely on his wife to communicate. He used his only moving finger to communicate to her. He developed a code to make her understand his communication. Initially everyone thought he was foolish. Fast foward 13 years and his instructions were interpreted by his wife and passed on to the engineers. Brooklyn Bridge stands as a spectacular land mark and an Inspirational True Life Story for people who face obstacles. Never allow circumstances to over power you. There are lot of things to be learnt from this inspirational true life story, such as love, dedication, commitment, faith, vision Intuition and more importantly NEVER GIVE UP.